For some time now I’ve been thinking about visitor interaction with museum objects, and the possibilities this offers for sparking reflection and conversation around a certain object and space (though any span of time). This interest was fuelled by a (faltering) project to use QR codes within a local museum, and by my experience with museum objects as clues within Alternative Reality Games; this was juxtaposed against the plain, traditional object labels I was seeing in museums up and down the country during conference season. The final spark was a conversation on Twitter with a couple of museum-friends from the British Museum about museum audiences and dumbing down/maintaining academic standards. So, on the eve of Museums and the Web 2009, I present my first thoughts on an object label for the Web 2 generation. Notes follow the diagram. (0) is obviously the name of the object. Timeline. This shows roughly where the object sits in relation to key events, to give a broad frame of reference. Quick information in large type: designed for young visitors, those with poor sight, those in a hurry, those with only passing interest, etc. Pictures accompany where useful. More information: expands on the Quick information, for those who want a little more detail. Further information: the full catalogue entry (or a reduced section of it) for those wanting a detailed description or who have an academic interest. More Info: the QR code and short web address both provide access to the main catalogue page on the museum’s web site. This could be augmented with audio visual or discussion options (see 9). Discuss: this is for visitors to provide their own comments or opinions on the object. They have the option to send an SMS message, send a message or start a realtime discussion via Twitter, or mention it on blogs, Facebook or other web2 platforms which support tags (the #bm_snake text). These comments/messages would be aggregated in real time to the info page (8) to allow other visitors past, present and future to read and comment on them. Braille title for the object, at low level and always in the bottom right corner. This hypothetical label is clearly a little over the top, and packs a lot of ideas in. However, it’s not particlarly unclear, and with work and testing could form the basis of a very workable method of labelling objects for a wide audience, and encouraging engagement in contemporary ways (but largely new to museums). As an additional option, copies of the labels could be provided as cards for visitors to take away – allowing them to look in detail, access the Info/Discuss options when they have a web connection at home, school or work, and use them in a trading/swapping game (see 3). Copies might be in stock next to popular/major items, but available to print on demand within the museum’s shop or at the exit to galleries (a small charge for the cards/printing would help offset the relabelling costs too). The Cambridge Museums group, for inspiration on the top trumps-style game coming from their excellent collectable cards series. Terhi Nurmikko, British Museum, for the idea of physical cards, and for feedback on the prototype. 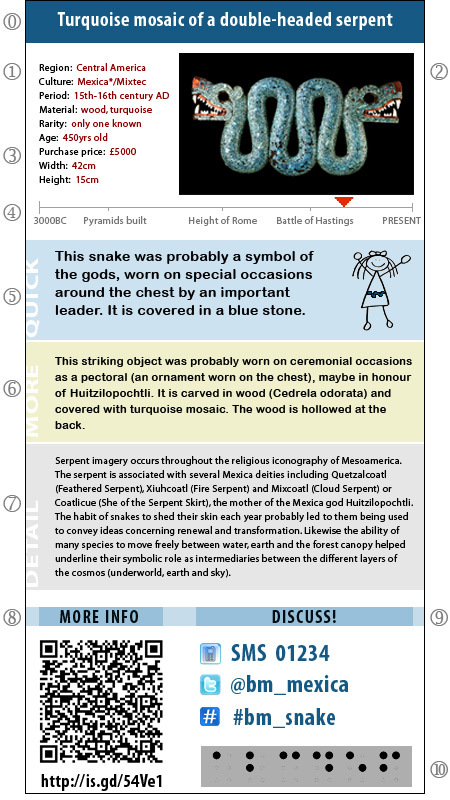 The British Museum, for the excellent information available on the Turquoise serpent used in the example (note that some incorrect information has been added to the core record: see here for the full version).